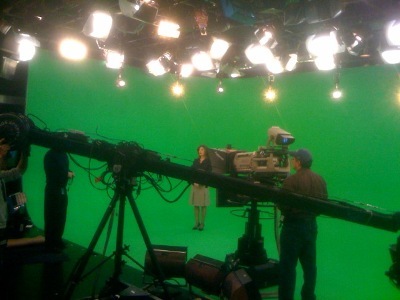 This photo, taken during NBC's primary election coverage, shows the green screen studio being used at that time. This is the last of an exclusive three-part series on Brainstorm America, the company behind NBC News’ 3D election graphics. Part two, coming Friday, will focus on how Brainstorm’s team developed the NBC News look and feel. Part three, coming next Wednesday, will cover Brainstorm’s vision for using its technology in local news. Read the first installment here and second installment here. For the most part, fully-immersive 3D environments with real-time camera tracking and data integration has been outside the reach of local television news. However, Brainstorm USA’s J. David Hoffman, thinks that may change soon. More details and images after the jump. Hoffman mentioned that Full Sail University in Orlando, Fla., has started focusing on this technology. 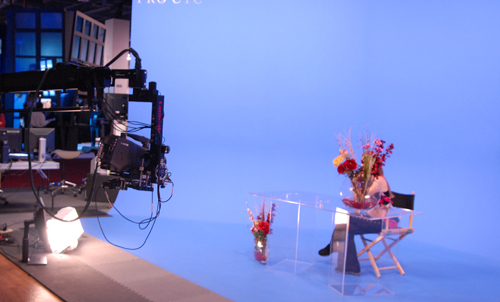 This image shows a Brainstorm demo at NAB 2008. The main advantage virtual sets bring to television is the speed of production change and volume of throughput. One-off or short run programming can be done more cost effectively or with raised production value with the technology as opposed to hard set productions. Though Hoffman won’t comment specifically on the future uses his company is targeting, he did mention business-to-business communication as a possible arena for the technology. Brainstorm eStudio also has potential applications as an all-in-one graphics system for television news, including the local news market. 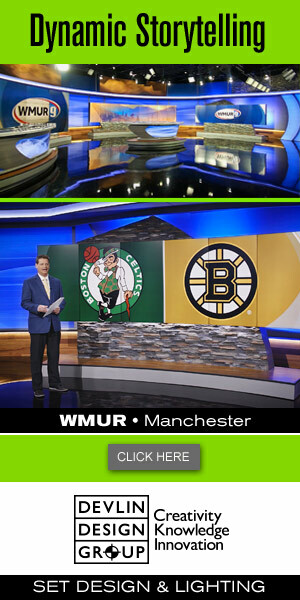 The system can render and output everything from standard news graphics to the fully immersive environments seen on NBC.